Join us for the UK’s First Industry Awards for Black Beauty products! BEAUTY meets FASHION meets ART – A Celebration of Diverse Beauty and Entrepreneurism. The iconic Porchester Hall comes to life at night taking its rightful place as one of London’s premier venues! We look forward to welcoming you on the Red carpet 23rd February 2018! 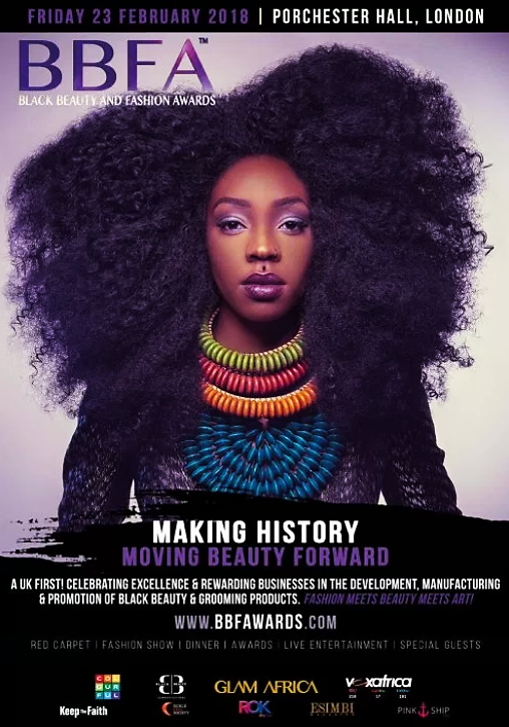 Black Beauty and Fashion Awards encourage entrepreneurship in the development and promotion of black skin and hair grooming products and give annual awards to the manufacturers of grooming products suitable for use by Black/Multiracial men and women. BBFA is passionate about supporting entrepreneurs and creating opportunities in an industry dominated by other ethnic backgrounds. Established to advance the personal care industry and also alleviate social exclusion, it is the first of its kind in the United Kingdom. This premium annual ceremony, attended by entrepreneurs, dignitaries, business owners and the public, is a ‘people’s choice’ award. Winning brands/products are determined by votes gathered in an online poll from members of the public and an expert judging panel. A key part of BBFA‘s mission is to foster advancement. Moving beauty forward whilst promoting equality, corporate social responsibility, social inclusion, and celebrating diversity. BBFAwards ceremony will take place 3rd November 2017 at Porchester Hall, London. The awards night itself includes a reception, 3-course dinner, fashion show, live entertainment, exhibitors, networking and more. The People’s Choice Awards are decided by the public, Special Awards are granted by an Expert Judging panel, and the Constituency Award shortlist is made up of businesses nominated by current MPs.